Jess Steinfelds is a coast-loving Australian living in the mountains of Northern California. As the owner, designer and maker of Made Wherever I Am she brings a casual coastal style to a Wild West mountain classic - the bandana. Taking this tradition to another level, Jess creates unique bandana-style cowl scarves using natural fibres such as wool and cotton. With just the right amount of fabric for a cozy neck and torso, her scarves are easy to wear, giving an effortless style with a cheerful pop of colour. Jess knits each scarf on a small knitting machine, hand seams them, then uses a long needle to weave in the colourful designs. Growing up with textiles in her genes going back at least five generations - her mother is a textile artist and her grandfather worked in what he called "the rag trade", his grandfather was a silk merchant, and his father before him a draper - from her teenage years Jess chose photography as her creative path. But sometimes you can't fight what's in your genes. 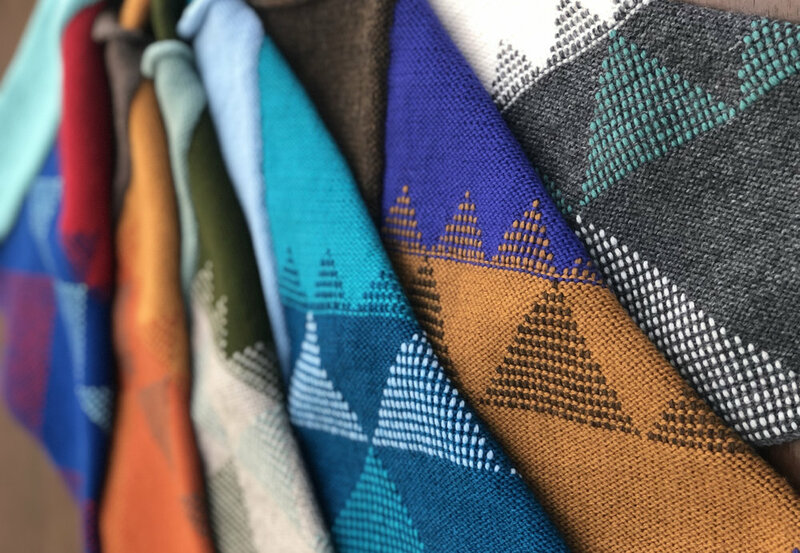 With a life long love of putting colours together, finding joy in the conversation that goes on between colours, the unique knitting and weaving combination that is Made Where Wherever I Am feels like something Jess was born to do.